For Assam Postal Circle Recruitment 2017 the Director of Accounts (Postal) , Assam Circle , Guwahati proposes to fill up some of the vacant posts in Group 'B' and Group 'C' cadre on deputation basis from among the staffs working in Central / State Govt./ PSUs as per the details given below. Eligibility conditions to apply for the above posts are enclosed in Annexure-A. The period of deputation will be initially for three years and can be further extended by two more years if required in the exigencies of public service. The Director of Accounts (Postal) , Assam Circle invites applications from the eligible candidates to recruit in the following posts. Total vacancy is 18 Nos. Monthly Salary- Level-6 of Pay Matrix equivalent to PB-2 (9300- 34800) of pre-revised pay. Working knowledge in all modules of MS office / MS Word / Excel in computer. Require Age- Maximum age limit for appointment on deputation shall not exceed 50 years as on closing date of receipt of application i.e. 04.09.2017. Monthly Salary- Level-5 of Pay Matrix equivalent to PB-2 (5200- 20200) of pre-revised pay. Monthly Salary- Level-2 of Pay Matrix equivalent to PB-2 (5200- 20200) of pre-revised pay. Officials holding same / analogous posts in various Ministries / Departments of Central Govt. / State Govt. / PSUs / Autonomous Bodies of Central Govt. On regular basis. The Departmental officials in the feeder category who are in the direct line of promotion will not be eligible for consideration for appointment on deputation. Similarly, Deputationist will not be eligible for consideration for appointment by promotion. Period of deputation including period of deputation in another ex. Cadre post held immediately preceding this appointment in the same or other organization / Department of the Central Govt. Shall ordinarily not exceed three years. The format of application is appended in Annexure-B of the notification. You can Download the Advertisement & Application Form from here. The application from the willing and eligible officials whose services can be spared may be sent along with attested copy of ACRs/ APARs for the last five years, integrity certificate and vigilance certificate so as to reach the undersigned on or before 04.09.2017 through their Departments /Head of Office duly approved by the Competent Authority. Assam Circle, Guwahati- 781 008. I have shared all the important knowledge for the upcoming Assam Postal Circle Recruitment here. 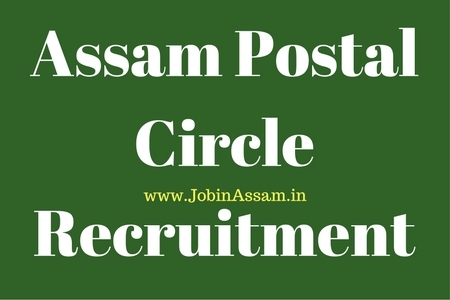 Assam Postal Circle Recruitment will be a good job for you if you are eligible for the post mentioned above, apply before the last date. Monthly pay for the Accountant and Clerk job in Assam Postal Circle are also good. For more about this Assam Postal Circle Recruitment vacancy like our JobinAssam facebook page and twitter page of JOBINASSAM.